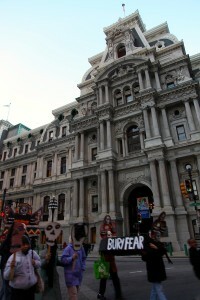 Carrying cardboard coffins and wearing “Day of the Dead” masks, pro-immigrant groups led by the New Sanctuary Movement marched on Philadelphia City Hall and the District Attorney’s Office on Monday, seeking to end the contracts that govern cooperation between local police and the federal Immigration and Customs Enforcement agency. Critics of the agreements, under which police share preliminary arrest data with ICE, say they lead to racial profiling and cause immigrants to fear and avoid encounters with police. The resulting reluctance to report crimes makes communities less safe, they say. Supporters of the agreements say they are necessary components of security and border control. 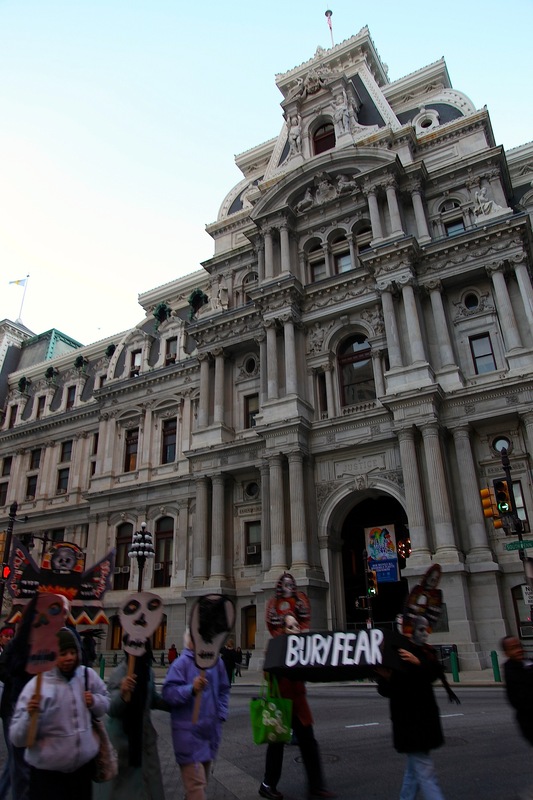 The 60 demonstrators wore black veils and carried three coffins – marked “Bury Fear,” “End PARS,” and “End Secure Communities” – that they deposited outside the District Attorney’s Office building. PARS – the city’s Preliminary Arrest Reporting System – was a subject of controversy last summer when the Nutter administration said it intended to end the contract, then extended it for a year under a compromise that removed the names of victims and witnesses from the database. Critics contend the compromise did not go far enough. Secure Communities is another county-federal program designed to target violent criminal aliens for deportation, but its critics say it snares many “non-dangerous individuals,” too. Congregation member Caroline Cargo, of Paoli, said Central Baptist was part of the original church sanctuary movement of the 1980s, when it offered protection against deportation to Central Americans fleeing wars in their countries. Participating in Monday’s protest was a natural extension of that tradition, she said. This entry was posted in Press (Pennsylvania) on November 3, 2010 by Ian.